I wanted to post an account of what happened today when my wife Rebecca and I decided to march in solidarity with the #OccupyWallStreet demonstrators. The plan was a relatively small, peaceful march from Liberty Plaza across the Brooklyn Bridge for a picnic at Brooklyn Bridge Park. We arrived and met up with three friends. The march up Broadway was completely peaceful and relaxed, both on the part of protestors as well as police. 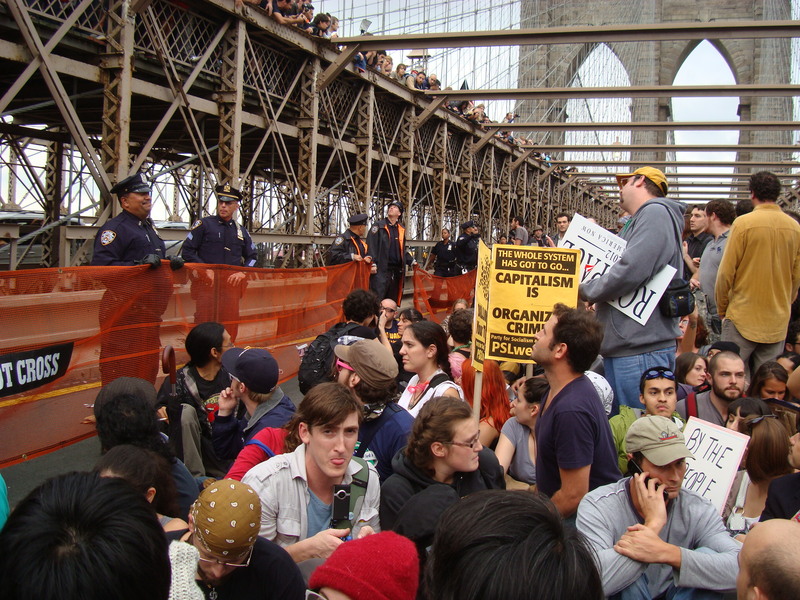 When we got to the Brooklyn Bridge, we saw what appeared to be a line of police that divided the crowd. Some went to the upper level pedestrian path, and others on the other side of the police line were funneled onto the lower roadway, in the left hand lane. We were part of the latter group. There was no clear way of going back once we were on the roadway, and at no time did any police make an announcement that we should not continue – the police walked next to us, and things remained peaceful. I assumed they were going to let us continue, as we would have moved along and crossed the bridge within the next 15 to 20 minutes. Rebecca and I and one male friend found ourselves at the back of the march. Suddenly, towards the middle of the bridge, a huge number of police appeared behind us with cars and vans. Again, no announcements were made. Apparently the same thing happened on the other side, at the front of the crowd. We were quickly penned in with orange netting on all sides. No one was ever given a chance to turn around or to get out of the situation. We stayed there for some time (over an hour) with limited information watching people get arrested on the upper roadway. The police brought in many paddy wagons and buses and told us to separate by gender (no one near us did). Everyone was calm and trying to communicate and negotiate with police to be allowed to leave peacefully. The police then started getting men only to line up, and they started arresting them. They were calling individual men forward. By this time, our other two friends, a man and a woman, had gotten into a different section of the crowd, and we were still with one other male friend. It was clear that they were going to arrest all of us. More paddy wagons and buses were coming in. As the crowd thinned around us, our friend walked up and got into the line to be taken into custody. We stood there for a while, and when it started to rain, we got under an umbrella with an older, white couple who looked to be in their mid-sixties or so. Then they walked up to a police officer, spoke to him, and he motioned for them to approach the ranking officer in front who was standing with a bullhorn. We then saw this couple walk out of the netted area and leave. As we were leaving, I asked one of the women what she had said to the officers before we came over and why they had let us go. She said she had struck up a conversation with an officer and told him he was “beautiful” and a “beautiful person” and that the “love and good vibes” she had sent his way seemed to have an impact on him. Oh, I’m sure. Meanwhile, our two other friends were still trapped on the bridge. Apparently they were not lucky enough to be allowed to leave. The last I heard, they texted that they were being told they were being taken to the 75th precinct, Broadway Junction. We don’t know the location of our friend who was taken into custody immediately before we, as women, were allowed to leave on the whim of an officer who thought someone standing near us was pretty. I just wanted to get this all down so one more account would be available. It was a needless, stupid (and apparently sexist) reaction by the police. I urge everyone to look into the reasons there are protests downtown and elsewhere in the country. The issues people are trying to draw attention to are real and important.